Cindy and George have 25 years of Chinese Martial Arts and are certified instructors/judges by the United States Wushu Kung Fu Association. 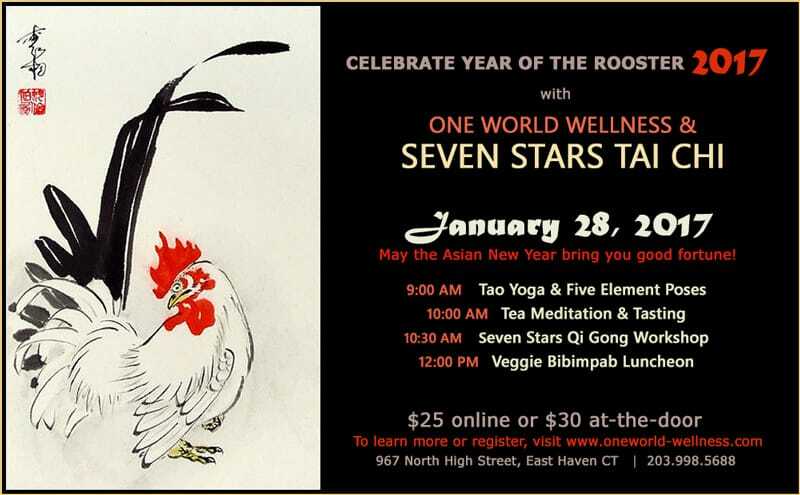 ​One World Wellness, in cooperation with Seven Stars Tai Chi, presents an event to honor Asian culture in the . . .
Instructors Cindy and George Hoag will lead an exploration of Qi Gong exercises. Practiced for hundreds of years in China, Qi Gong helps balance, nurture and enhance physical and emotional wellbeing. This experiential workshop will guide you through a simple 8 movement qigong set. The movements can be utilized in the standing or sitting postures. Instructor Christine Ucich leads a Tao Yoga practice. Based on the energies of the five elements and stretches for the health of our internal organ systems. Tao Yoga Assistant Instructor, Ada Rios, explains the significance of the lower energy center (sacral chakra) in Taoist breathwork practice. Tea plays an important role in many Asian cultures. Between practices, guests may sample green tea as a meditation and tasting. During the tasting, you will have the opportunity to engage with tea on the various sensory levels of sight, sound, touch and smell. After both practices, enjoy a luncheon buffet of vegetarian bibimbap, or "mixed rice," which is served topped with seasonal sauteed vegetables and an optional fried egg. 2017 Asian New Year Celebration takes place from 9:00 am to 1:00 PM, Saturday, January 28. Sign up for One World's e-news to receive the latest updates about classes and events!